NSFetchedResultsController is a very useful class provided by the CoreData framework. It solves many performance issues you frequently run into while reading a large amount of data from database and displaying that data using a UITableview, UICollectionView or MKMapView. You should always use the fetched results controller unless you have a good reason not to. In this post, I would like to show you why using a fetched results controller is a good idea. Consider an app that shows a list of news feed related to Apple products using a table view. We will call this app FeedLoader. When a row in feed table view is tapped, it shows more information about the feed in a detail view. We can approach the design of this app in multiple ways, but the one below will provide us a good context for discussing why not using a fetched results controller might not be a good idea. I won’t explain every aspect of the FeedLoader app in this post. I will highlight only those that are relevant to the discussion of NSFetchedResultsController. I have tried to write the code for FeedLoader in a clean way. Hopefully, you will be able to read it with relative ease. Let’s assume that there exists a news feed service that provides API for fetching news published between certain dates. When the user enters the feed list view, the process of downloading the latest news feed is initiated. Once the feed is downloaded, we persist them in a local database. That way we don’t need to make unnecessary calls to the news feed service when we want to show the feed that was already downloaded in the past. To keep things simple, we will read feed data from a JSON file stored locally instead of downloading it from a remote feed service. We can accommodate this change in our design by creating a protocol named FeedFetcher and a concrete class named FileFeedFetcher that conforms to this protocol. NSString *filePath = [[NSBundle mainBundle] pathForResource:@"feeds"
In the future, when we actually download a list of feeds from a remote server, we can easily create a class named ServerFeedFetcher that conforms to the FeedFetcher protocol as well. We can then inject a server feed fetcher instead of a file feed fetcher without having to change anything in FeedManager. ObjectConfigurator provides a light-weight framework for injecting dependencies. You can checkout the create_basic_setup branch from FeedLoader repo to see its full implementation. Through out this blog post, I will ask you to checkout a specific branch so that you can see various stages of the app in code as we change its design iteratively. 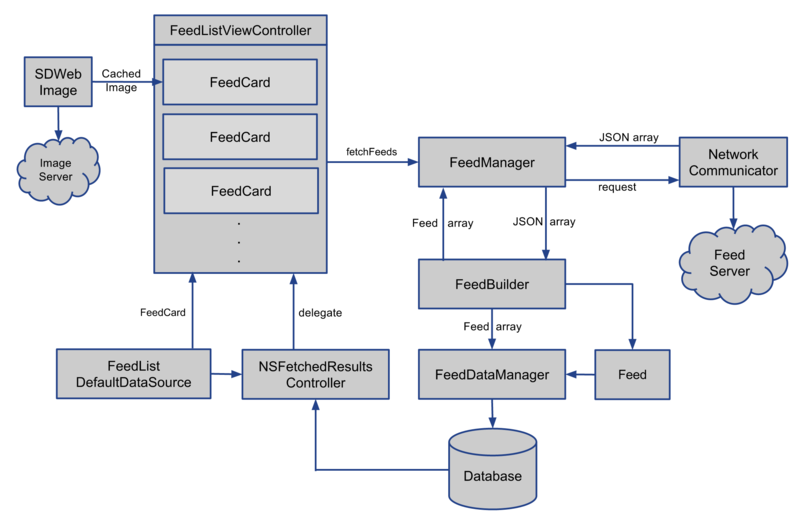 Once the FeedManager has retrieved feed JSON (either from a remote service or a local JSON file), it tells FeedBuilder to build Feed objects from that JSON. FeedBuilder creates a new Feed object only if one with the same source URL already doesn’t exist in database. When the builder is done creating Feed objects, it will tell FeedDataManager to persist them in a local database. Finally, it returns the Feed objects back to the FeedManager. FeedDataManager provides a layer of abstraction on top of Core Data. Instead of passing around the managed object context to any class that might need to query feed related data from the database and sprinkling complex fetch request code all over the place, we can simply ask FeedDataManager to perform specific data related task for us. For example, checking whether a Feed object with a specific source URL already exists or not. 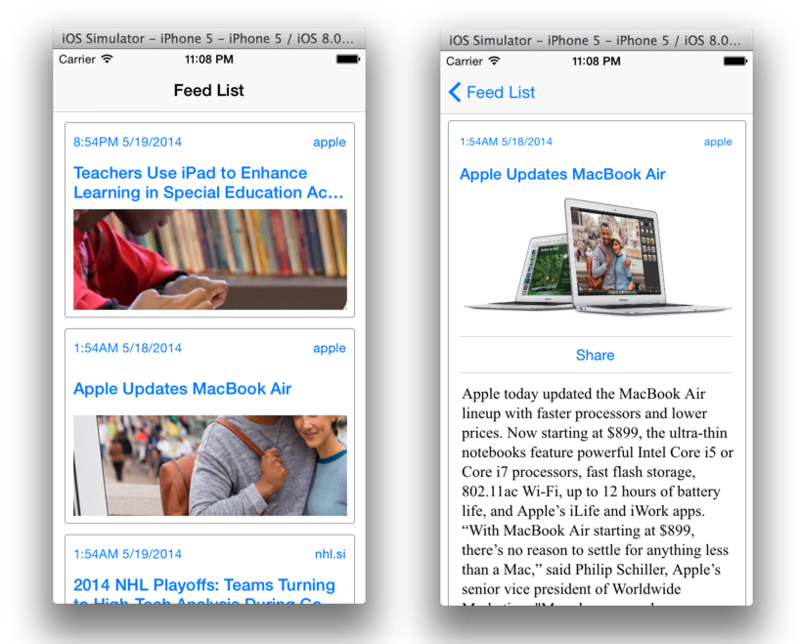 FeedListViewController uses custom cells of type FeedCard to display the feed information in a UITableView. Rather than creating the cells itself, the list view controller delegates that task to an object that conforms to the FeedListDataSource protocol. (A default implementation of the FeedListDataSource protocol is provided in FeedListDefaultDataSource class). The data source accepts an array of Feed objects. When the table view needs to display a cell at a specific indexpath, it asks the data source to provide that cell. 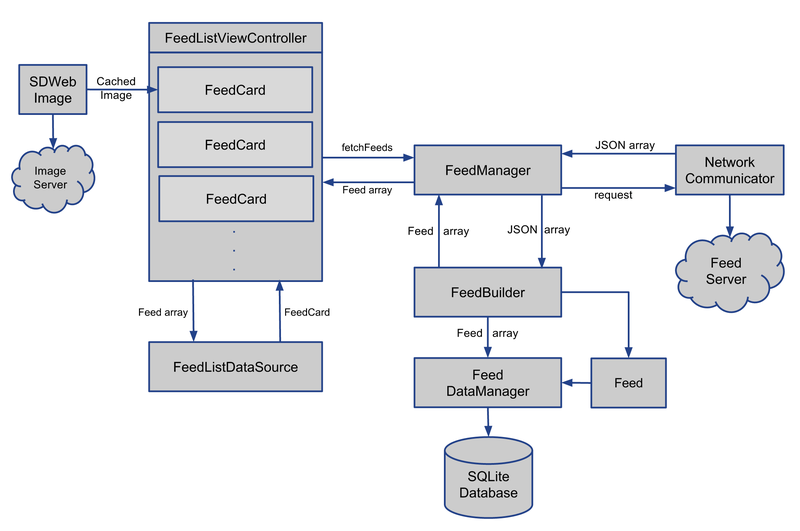 The data source then creates a FeedCard instance, populates it with feed data and gives it to the tableview. All information required to display a news feed is persisted in database except the image data. Feed objects store image URL but not the actual image data. A third party library called SDWebImage is used to asynchronously download images from a remote server and cache them locally on disk. SDWebImage adds a category to the UIImageView class. As a result, we can initiate the loading and caching of images by sending setImageWithURL:placeholderImage: message directly to the image view included in a feed card. Images are loaded only when needed, i.e., when a feed card is visible to the user. At this point, if you run the app second time, you will notice that the feed list is empty. The issue here is that FeedBuilder doesn’t create a new Feed object if one with the same source URL already exists in database. However, that seems like a bit of a hack to me. Also, if you look inside feeds.json file, there are only five feed items in there. Therefore, loading them all into the feed list table view won’t cause any performance issues for now. In reality the number of news feed that needs to be displayed will be much higher than five. Although, Apple engineers have done a fantastic job of optimizing UITableView, we still need to take care of the issue of not loading too many table view rows up-front by ourselves. What we need here is a proper caching mechanism that will not only retrieve feeds from a local database if we are unable to fetch new ones from a remote server, but also is smart enough to not load too many rows unless the user needs them. This approach will make scrolling through the table view quite smooth. It will also prevent the overall memory footprint from increasing unnecessarily. Let’s start building a foundation for that caching mechanism. The first thing we need to do is create FeedCache class. // order from ascending to descending. When asked for cached feeds, FeedCache returns all feeds in the database stored thus far. It also allows us to add new feeds into the cache. It essentially means taking the feed JSON, creating new instances of Feed objects from that JSON, saving them into the database and returning them back to the caller. 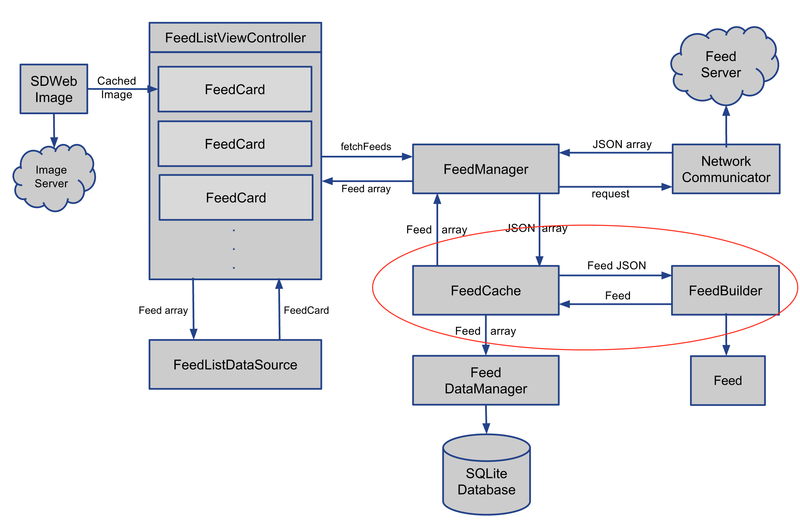 Now FeedManager can delegate the task of building Feed objects from JSON to FeedCache instead of FeedBuilder. Now when FeedManager is asked to fetch the latest feeds, it can simply return the ones in cache while the new ones are still being fetched. The original problem of empty list when we run the app second time can now be solved by displaying the cached feeds when user enters the feed list view. Now that we can fetch feeds incrementally, we need to give the table view data source an ability to add new feeds to its collection. Finally, we need to insert new rows into the table view when we receive new feeds from a remote server. With the addition of caching, our initial design has evolved a bit as shown in figure below. 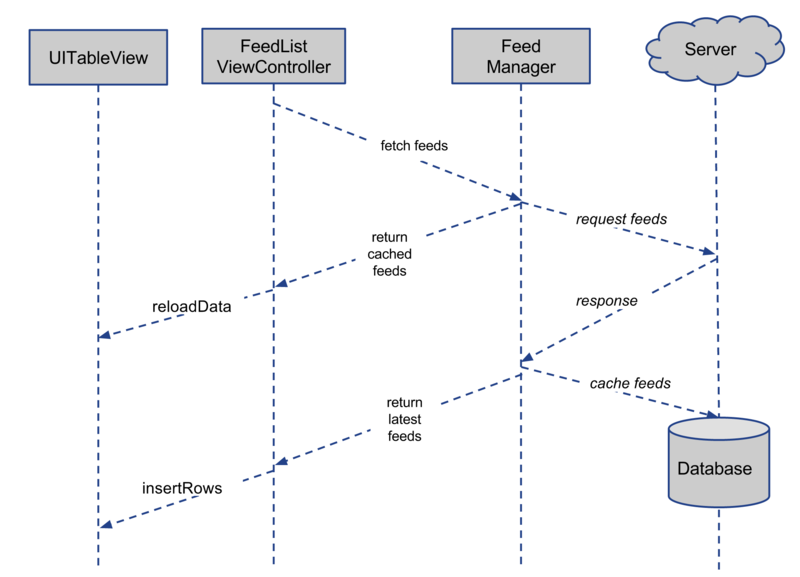 Following diagram shows feed data flow from end-to-end with caching in place. You can checkout the add_caching branch from FeedLoader repo to see all the caching related code. Now that we have a basic caching mechanism in place, we can make it more robust by providing a way to specify how many feeds we want to fetch rather than returning everything in the database. We can also remove feeds that are not visible to the user from the table view data source. Currently, it holds onto each feed added to its collection which is quite inefficient because the collection could grow infinitely as we keep fetching new feeds. As you can see the to-do list for a robust cache keeps growing and growing as we add new performance related requirements. Monitor changes to Feed objects in database. Cache the results of its computation so that if the same data is subsequently re-displayed, the work does not have to be repeated. 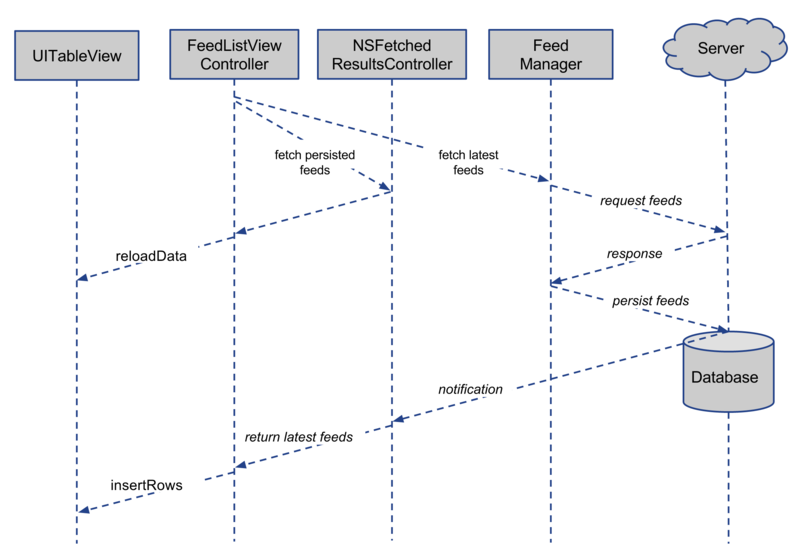 Rather than going down a rabbit hole of implementing our own caching solution, let’s give NSFetchedResultsController a try. First thing we need to do is expose the managed object context used by our Core Data stack via the data manager. The fetched results controller interacts with Core Data directly via the managed object context. Ideally, I would have liked not to leak this implementation detail related to database to our business logic but if we want to use the fetched results controller we have no other choice. You can checkout the replace_caching_implementation_with_fetched_results_controller branch from FeedLoader repo if you would like to follow along with the code listed in this section. Now instead of manually adding the new list of feed returned by FeedManager to the data source, we can simply give it a fetched results controller. We also need to modify the FeedListTableDataSource protocol to take the fetched results controller instead of manually setting the feed array. Finally, we need to implement the delegate methods the fetched results controller will call when the managed objects in Core Data are created, updated or deleted. When the fetched results controller is about to start sending change notifications, it will call the controllerWillChangeContent delegate method. We need to prepare the feed table view for updates in that method by calling beginUpdates. If a Feed managed object is created, deleted or updated in database, we insert, delete or update a table view row respectively. When all current change notifications provided by the fetched results controller have been received, we need to tell the table view to process all pending updates by calling endUpdates in controllerDidChangeContent: delegate method. The end-to-end feed data flow has also changed with introduction of the fetched results controller. You might be thinking that this blog post has been a giant waste of time and I agree with you. In the beginning I mentioned that you should always use a fetched results controller unless you have a good reason not to. I could have stopped there and moved on with our lives, but I went on and on to show you why it’s a good idea to do that. We started with a code base that didn’t have any caching mechanism in place. We implemented our own caching and then replaced it with a NSFetchedResultsController instance. In one of the projects I worked on, I came very close to implementing functionalities already provided by NSFetchedResultsController. I thought I would share that experience with you so that you won’t waste time trying to reinvent the wheel like I did. The full code for FeedLoader app is available on GitHub.